It was the perfect start to the weekend... an early morning swim (excuse me for a second, while I polish my halo!) and then off to the beach to do a bit of treasure hunting while the tide was out. Fancy coming with me? Oh go on! At last, a nice painted piece...I get so excited when I find nice bits like this! And another! But it was well and truly wedged under this rock. I managed to snap about half of it off... and using both the above bits of weathered ply, made these! Love the different washers ! The wall-hung boats are to sell at the Homespun Fair on Easter Monday (only a week away) but if no-one buys them they will go in my Folksy shop. Lastly, I would like to say a big 'Thank You' to Dinky Daisy for this lovely lavender keyring which I won in her blog giveaway! Isn't it the cutest? Back soon guys, enjoy your week! * a local term for beachcombing, duh! Cor blimey, that's nearly another week gone by, I don't know where the time goes! Designed to either hang on the wall or from the ceiling and filled with lavender to aid sleep! And as a final little touch I added some text - can you read it? I thought it would make a lovely gift for a new born baby, what do you think? 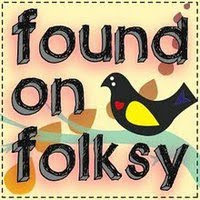 You may have noticed the lovely image at the top right of this blog, which is advertising the Homespun Fair. This is taking place at Portscatho Memorial Hall on Easter Monday. I realise that for many of you, Cornwall (and West Cornwall at that) is just too far away, but for anyone local, please come and say hello and have yourself a cup of tea and a bit of cake! It promises to be a great event - and it would be lovely to meet you! I spent yesterday sewing this lot of lavender fish while the youngest was at his weekly pre-school session - the time goes so quickly! I don't usually have the time to do Easter decorations, but I bought these polystyrene eggs - and thought it would be a pretty and colourful way to use up my many scraps of cotton. Extremely easy to make: you'll need scraps of fabric or paper (cut into smallish pieces), glue and a bit of ribbon or lace. I just need to attach a bit of ribbon to hang them from a twig or two...I noticed yesterday that the willow in the garden is starting to show it's 'furry' buds - that will be perfect! Finally I took delivery of a very exciting package this week - a pair of fabulous CK cowboy duvet sets. Aren't they smashing? Another cushion! I had real fun with this one! He was inspired largely by 'Rosie's Walk' by Pat Hutchins (this book is over 40 years old, but still looks fabulous today - love the retro illustrations) and various designs by scandinavian design company Isak. I am rather fond of his dandy polka dot cravat - that kind of evolved as I was working - I found the red spot fabric at the bottom of the cupboard and thought it would match quite well. I can't decide whether he is Fantastic Mr Fox or the character from Pinocchio! It was lovely giving him some instant clothes and a tail... I felt like that bloke from 'Art Attack'! Just managed to take the top photo before my youngest added his own accessories!! Fantastic Mr Fox meets Eddie Izzard! Hope you're having a good week! But I have spent a lot of time in Blogland recently and read some truly touching stories about loss: women who have lost their mums this year and tragically, those that have lost a child. For them, Mother's Day, along with birthdays and Christmases, must be so hard and incredibly painful. To those brave ladies, I hope you find some peace tomorrow. I had another fruitful trip to the beach at the weekend, enabling me to make a couple more larger pieces. I like the cheerful one with all the flags - it stands alone or can hang on the wall. Both available from my Folksy shop. Hope you're all enjoying the lovely Spring sunshine! The seed for this beast was actually sewn about 6 years ago when I made a t-shirt for my eldest son. It was made from an old pair of jeans that had seen better days and featured a whale made from the denim, with the metal zip as the teeth and a tiny rivet for it's eye - how's that for recycling?! The whale's elongated body kind of stretched around the side, so that it's tail was on the back. It was so cool, I've searched high and low for that t-shirt so that I could show a photo, but - no joy! The zipped mouth idea stayed with me however, and I've finally incorporated it in something else - a cushion! I really wanted to use a bold, bright printed fabric - maybe turquoise and royal blue - and with a zingy orange zip, but as yet haven't found the right one. And me being Mrs Impatient, I had to make it, so this plain cotton fabric had to do for now! Originally I was going to insert the zip properly - with my first attempt I actually cut the fabric across where the mouth was going to go... but this gave me a real headache! The long edges were no problem, but I couldn't figure out how to finish the corners without using darts....which looked rubbish! I persevered though - and decided to stitch the zip straight on to the right side of the fabric - much easier and therefore much quicker which is always a good thing. I stitched some contrast polka dot fabric (cut just slightly smaller than the zipper) to the back of it so that when you undo the zip, a nice red 'mouth' is revealed! And I didn't even need a zipper foot on the sewing machine as I didn't stitch close to the teeth. I'm quite pleased with Wally - and I can see me having another go in different fabrics - as and when I find them. This one is for sale in my Folksy shop. Finally, I just want to say thank you for all comments left lately... this can be a bit of a lonely job sometimes - but getting feedback from you guys motivates me no end! Back soon! It's been a good week and it certainly feels like Spring is on it's way! On Saturday, we headed off to the beach in search of 'treasure' and found quite a bit, so I've been busy crafting with it all! 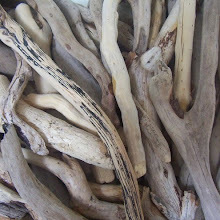 The fantastic thing about working with driftwood is that you're completely led by the materials. Solid beach huts are a new thing for me, but I found a piece of wood just the right shape - it was crying out to me to turn it into a couple of beach huts with jolly flags on the roof! Here's another piece... the mast is actually a piece of bamboo that has obviously been used to stir paint (probably for someone's boat). I thought it matched the colour of the driftwood 'sea' perfectly! It was sunny and mild sitting on the sand: we whiled away several hours down there! The boys pottered and made pictures from various bits of debris, and Steve even took an impromptu dip! I emptied out all of my found treasure and played around, daydreaming of what I was going to create! I have absolutely no idea what it is - it's made from rubber I think, but I thought it would make a great 'hook'... The proportions are clearly completely wrong, but haven't you heard of artistic license, darling?! Normally, I wouldn't work this big (the hull of this wall-hung boat is nearly 30cm square) but I'm actually rather pleased with the way it's turned out! I'm not going to put this in the shop yet, I want to keep it for myself, at least for a while. I like the heavy duty washers - nice and chunky for a vessel this size! I'm delighted to discover that I'm a featured seller on Folksy this week and have also got a new online stockist called Beardog & Joolz. 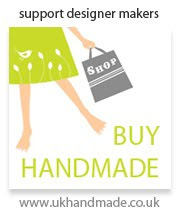 They sell some lovely items - my favourites are the vintage muffin moulds - at very reasonable prices. Check it out!